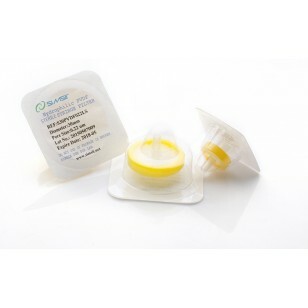 PVDF Syringe Filters - Filtration Supplies | Simsii, Inc. In the HPLC sample and general biological sample filtration, a PVDF syringe filter is preferred for its low protein binding capacity and superior flow rates. At Simsii, we manufacture the best variety of this filter in 13mm, 25mm, and 30mm. It is used for protein sequence analysis and works exceptionally well with aqueous samples. Simsii’s PVDF syringe filters are hydrophilic in nature with great chemical compatibility. They can bring precision to your research and ensure the highest levels of performance. Our range of filters is designed with female Leur-lock inlet and male Leur-slip outlet. Also, these filters have a better mechanical resistance and it can withstand high temperatures as well. In the sterile PVDF filters, polypropylene is widely used as the housing material. For further details, please call us now.